Ben Bridge Jeweler Reviews - Low Quality, High Prices. As you will see below, our experiences at Ben Bridge have been mixed. I would prefer to give them the benefit of the doubt when it comes to the service and assume (hope?) that our second experience, which was fantastic, is the more common experience at Ben Bridge. What was consistent between both secret shoppings was the value. 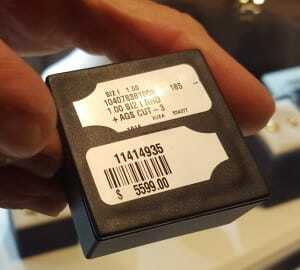 Simply put, all of the diamonds we saw at Ben Bridge were poor value for the consumer. 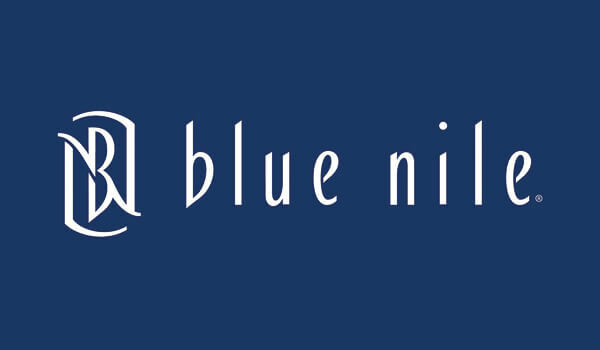 You can read more below, but you get way better bang for your buck shopping from Blue Nile or James Allen. 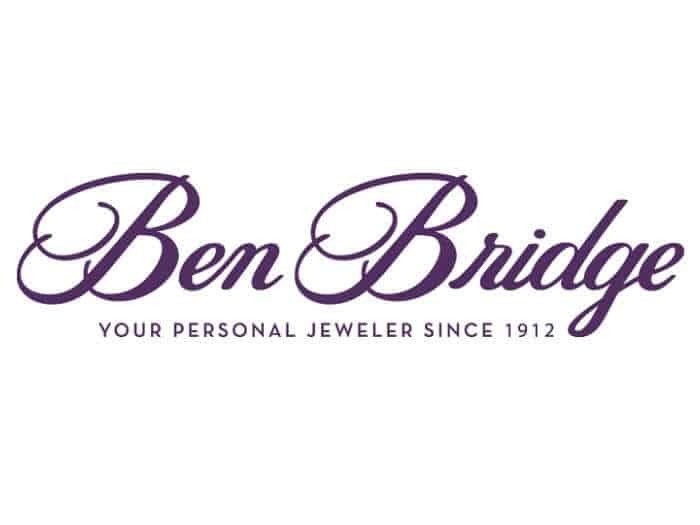 Ben Bridge is one of the oldest and established diamond jewelry mall chains in America. 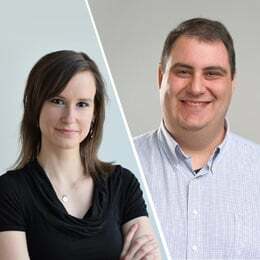 Their history began almost one hundred years ago with a shop in Seattle and they positioned themselves as a pioneer in the mall retail experience with their first shop in Seattle’s Southcenter Mall in 1968. Ben Bridge expanded out of state in 1980, and has since rapidly grown. In 2000, Warren Buffet’s Berkshire Hathaway invested in Ben Bridge. 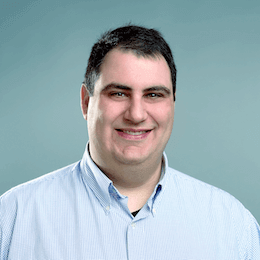 They currently have 86 locations in the United States and Canada, primarily on the West Coast. We are going to work backwards, as our most recent secret shopping is more pertinent for you, the reader. Annie and I visited Ben Bridge in San Diego while secret shopping in California. The experience was a vast improvement over my first visit. Not only was the store giving off a much more luxurious vibe, the saleswoman was simply fantastic. The first ring we looked at in San Diego was a 0.50ct H color, I1 clarity diamond in a simple pave setting for $2,999. For an I1 clarity diamond, the diamond was pretty nice. We could definitely see the inclusion, but it was not harsh and the diamond was very bright. The second diamond we saw was a fantastic 0.76ct I color SI1 clarity round diamond. This one was AGS certified and ideal cut. The diamond was eye-clean, and incredibly brilliant. This diamond was loose. They told us they can add it to the setting from the first diamond (which was $1,000). So lets take a look at the first diamond (the 0.50ct H, I1). Here is a similar diamond from James Allen. It is a 0.50ct H color, I1 clarity round diamond with a GIA certificate for $800. You can add this diamond to this understated pave setting for a total cost of $2,000. The second diamond we looked at was a 0.76ct I color, SI1 clarity round diamond that was fantastic. Here is an equally fantastic 0.76 I color, VS2 clarity round diamond for $2,700. While in Seattle on business, Ira and I had an opportunity to visit Ben Bridge’s location at the Alderwood Mall in Lynwood, WA. I don’t think we need to explain much about the ambiance and setting, as this is a mall store; there is absolutely no sense of luxury or uniqueness to the experience. We were approached by a saleswoman as we were looking at the display cases. She was very kind and not pushy at all. While that is a plus, the “education” she offered us was abysmal. First she went on and on about being a member of the American Gem Society, as if that is unique (it’s not) and meaningful (again, not). She then proceeded to go on and on about how important cut is when buying a diamond and that everything else is secondary. The saleswoman’s mantra was good for us to hear but, as you’ll see below, the rhetoric did not match the product. The first item we looked at was on the lower end. 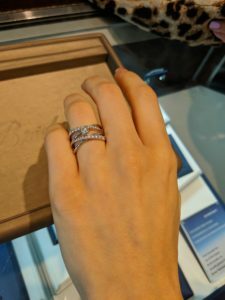 It was this ring, with a 0.38 K I1 (she claimed that all their diamonds are certified by AGS, but I didn’t see a certificate). The price was $2,599 plus tax for a total of $2,845. We asked the salesperson for a breakdown of the price and she said that the ring itself is about $800-1,000 (as we were discussing getting a larger diamond). First let’s talk about the quality before getting on to the very high price. The ring itself was decent quality. The craftsmanship was fine and the pave diamonds were nice looking. It is a very minimalist halo (only 1/7th of a carat worth of diamonds), which is why the setting cost is so low. For the price and expectations, the setting is fine. The diamond was not a bad K I1. The inclusion was a noticeable black spot under the table, but it was not bad for an I1 (at least not one of this size). The color was noticeable in the setting (which is why we recommend higher color for halo settings as we explain in our color article), but I don’t think it was lower than K. The cut on the diamond was about average (I’d say it was on the low end of excellent cut). But what about that exorbitant price? A 0.38ct K I1 valued at $1,500? That diamond is worth a third of that. Here is a diamond that is 10% larger for about 1/3rd of the price. Personally, I wouldn’t buy a setting like that with a K color diamond. But even if I picked out superior quality to what they offered, you’d still save quite a bit. I would recommend a ring like this, paired with a diamond like this. You end up with a far superior ring in every way possible (better color, better clarity, more diamond weight on setting) for $1,820. That is a whopping 36% cheaper for a far superior product. Not to mention, if you don’t have it shipped to New York or Maryland, you wouldn’t pay sales tax. The salesperson really got on our nerves when she showed us a larger diamond to accompany that setting. It took all the willpower we can muster to bite our tongues. After hearing all about Ben Bridge’s focus on cut and how that is their highest priority, we were shown this terrible diamond; a horribly cut 1.006 I SI2 for $6,130 (including tax). There is just no excuse for a company with a shred of respect to have this diamond, and its flat out embarrassing to have them show it to us after giving us their salesman BS lines about how important cut is. If you take a look at a round diamond search on James Allen (or any other respectable site), you will see that about 90% of all diamonds listed receive an Excellent or Very Good cut grade from GIA (or a 0 or 1 cut grade from AGS). This diamond falls far below any of those. It is scraping the bottom of the barrel. While you need to make sure the diamond is proportionate, the most important cut characteristic to focus on is depth. 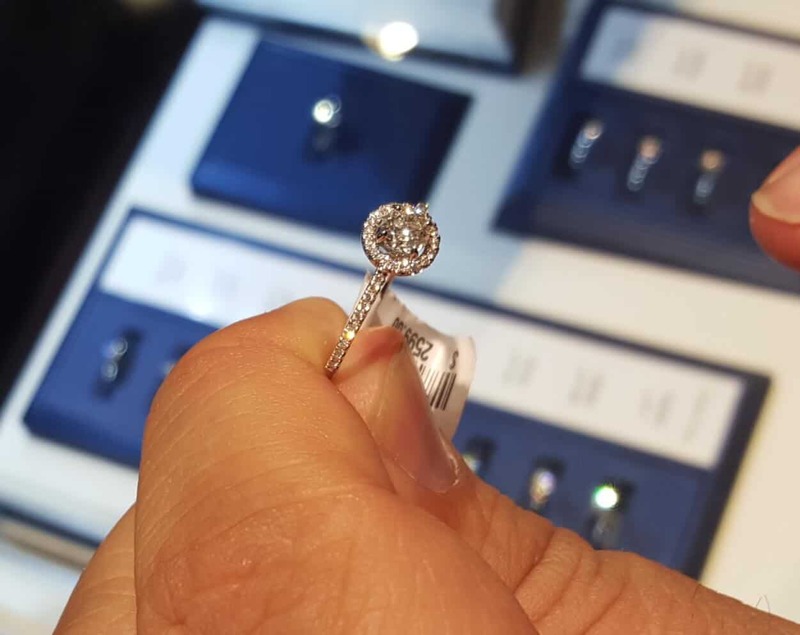 Not only will a deep diamond be less brilliant (an area the saleswoman claimed was the most important), but it will look smaller (as we explain in this article). This particular diamond is “off the charts” deep. Now let’s compare it this diamond with one I found online. Here is a beautiful 1.02 I SI2 I found on James Allen for 25% cheaper. The cut is head and shoulders above the diamond we saw in Ben Bridge. If you compare their diameters (their noticeable size), you will see that this diamond looks 5% larger AND it will be far more brilliant. They aren’t in the same league. I can’t imagine any honest jeweler trying to sell the diamond that Ben Bridge was pushing. I certainly can’t think of any justification for them selling such a terrible diamond at such an outrageous price. We know that brick and mortar retailers just can’t compete on price with a good online retailer. Their business model has way too much overhead built in to their system that the price has to be higher. From there I like to break down brick and mortar companies into three categories. You have the elite luxury brands that are adding a level of “prestige” and packaging. You are paying a huge premium to say you bought the ring at Tiffany & Co or that you are wearing a Cartier ring. Ben Bridge doesn’t qualify on this account. The premiums they charge are just way too high. Their pricing seems to be on par with some of the elite luxury brands. Even during our better experience at Ben Bridge however, the level of service and luxury did not match the level of those luxury brands.